American military (militarians) have applied a battle laser of the future - it have destroyed a ballistic missile. Trials took place in February, 2010 in the sky of California and had fulfiled successfully. The purpose had been captured (fixed) in few seconds by means of measuring of atmospheric perturbations, and then a beam of directed energy had melted (fused) a missile and had caused nonreversible disturbances (damages) of the construction. All operation took less than two minutes. Several large companies took part in the creation of this complex. Corporation Boeing gave a plane bearing facility (installation). 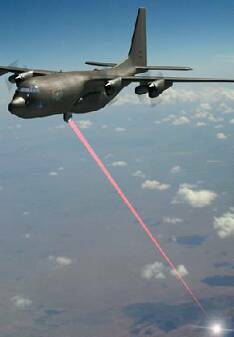 Northrop Grumman created a laser of high power. Lockheed Martin elaborated the control system of a beam and firing. American military do not hide that a directed energy beam weapon is the weapon of future. My commentings: Half a century ago only fantastic novels wrote about laser weapons. But in II millenary BC - books. So, the most ancient Indian epos "Mahabharata" depicts (portrays) a lethal weapon called by a "dart of Indra". "A mighty effort of will he (Karna) has mastered by himself , and has called an appearance (effects) of the "Brahma weapon"(atomic weapons). Then Ardzhuna has called by spells (charms) the "Indra weapon". According to Old Indian texts, a dart of Indra was managed by means of a circular reflector. At activation it gave a beam of light which was directed (aimed) at any purpose, being oriented by sound, and when it had been focused on it, immediately "devoured it by its force". By means of such weapon Krishna had striked the vimana (flying chariot) of his enemy, demon (Danava) Shalva - Saubha air city.